Before going for cooking let's see What is Horse gram?, It may helpful for those who don't know about benefits of Horse gram. Horse grams are an oval shaped bean that is usually thin and relatively small . It is a leguminous plant, Dolichos biflorus, a native of tropical and subtropical Africa and Asia, extensively cultivated in Southern India as a food-plant. In India, horse grams are called as கொள்ளு (Kollu) in Tamil, മുതിര (Muthira) in Malayalam, ఉలవలు(Ulavalu) in Telugu, Cowpea in English, Kulti in Hindi, Dou in Chinese, Habbul Kulth in Arabic. It is known to have phenols which help in Weight Loss. It is an excellent source of protein and contains good levels of the iron and minerals molybdenum. It is an good source of vitamins and amino acids. Its use in the diet is good for women as their menstruation is purified. 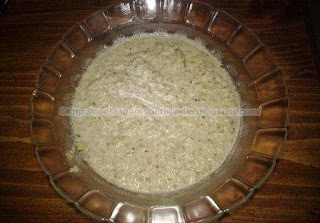 Horse grams are normally used to feed horses, though it is also commonly used in Tamil dishes, including kollu porial, kollu avial, kollu sambar, and kollu rasam. Here I am going to explain about the simple and healthy Kollu/Horse Gram Chutney. while grinding use Kollu (Horse gram) boiled water. Note: Horse gram is not good for pregnant woman, or a person suffering from plethora or tuberculosis. It also causes the formation of excessive bile.